Short-haired Woman: I can’t find my car keys. I’ve been searching for hours! Man 1: How awful that must be. Man 2: You must feel terrible. The next panel shows only a long-haired woman. Long-haired Woman: Guys, guys! 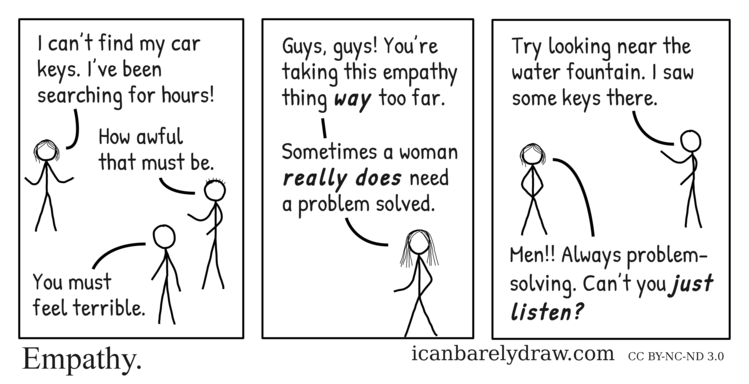 You’re taking this empathy thing way too far. Long-haired Woman: Sometimes a woman really does need a problem solved. The next and final panel shows Man 2 and Short-haired Woman. Man 2: Try looking near the water fountain. I saw some keys there. Short-haired Woman: Men!! Always problem-solving. Can’t you just listen?